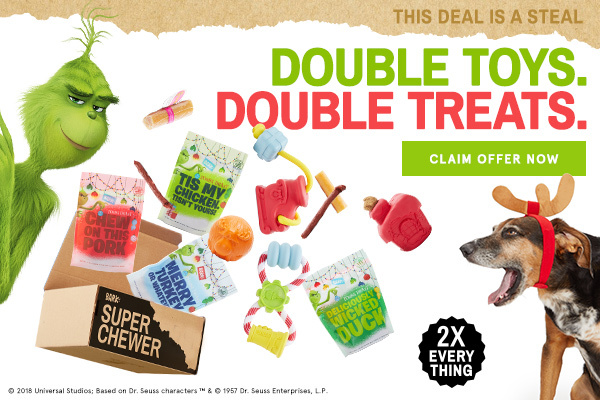 Super Chewer BarkBox FREE Double Toys and Treats Upgrade! Hey dog lovers! 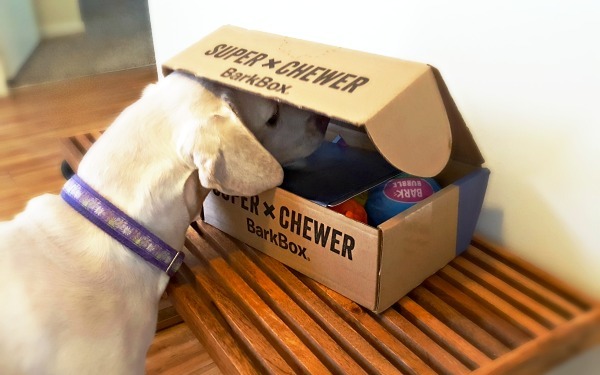 Double up your FIRST Super Chewer box for FREE during this BarkBox special offer. That’s FOUR super-durable toys, FOUR bags of super-tasty treats, and FOUR super-tough chews all in one box! Standard subscription continues after the first month. Offer valid on all subscription plan lengths (1-month. 6-month and 12-month plans). Visit this Super Chewer BarkBox page to get the FREE upgrade offer before it ends on 11/11/18. The folks that make BarkBox, the top dog subscription box service around, have designed a special subscription especially for dogs who need stronger dog toys and longer lasting chews. It’s called Super Chewer and it’s a monthly delivery customized for your dog’s size and food allergies. Sizes are: “Small but Mighty” for up to 20 pound dogs, “Middle Weight” 20-50 pounds, “Large and in Charge” for dogs 50+ pounds). Shipping is free for US and Canada, and every box comes with FREE TOY REPLACEMENT and a satisfaction guarantee on both the treats and toys. Visit our BarkBox main page for reviews, photos of recent boxes and to compare the BarkBox Classic edition and Super Chewer edition.